The Phantoms shoot down the Stars. - Christian Stoever makes a save in a 5-2 win over Lincoln. Well, I'm back... sort of. This will be my first post from my new house. Last night's tilt was against the Lincoln Stars, a team we were supposed to beat. The Stars have already accepted they won't be making a playoff run, and have traded off all of their worthwhile assets to rebuild next season. They are barely noticeable as the team they were to start the season. But, you give a team like that a chance by not playing your best and playing down to their level, and you'll get embarrassed. 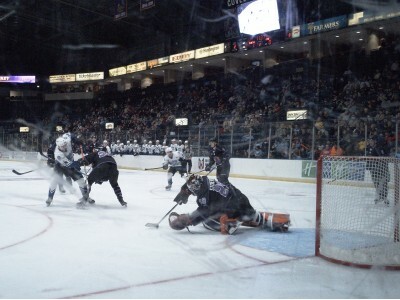 Fortunately for the Phantoms, that was (mostly) not the case last night. The game started a little slow. Neither team really generating much in the way of offense early or getting an upper hand territorially. The Phantoms struck first nearing the midway mark of the period. On a rush up ice, Treveor Kuntar took a short pass from Joseph Abate just inside over blueline and snapped a blistering shot from left faceoff circle that beat Stars netminder Samuel Hlavaj clean over the glove at 9:40. In fact, it was in and out of the net so quickly, it took a moment for some fans to register that it was indeed a goal. The Phantoms defeat the RoughRiders. - Christian Stoever kicks a puck aside in a 2-1 win against Cedar Rapids. Last nights game was almost a metaphore for the Eastern Conference. Two teams in almost a dead heat in the middle of the standing met and slugged it out in a 2-1 match. 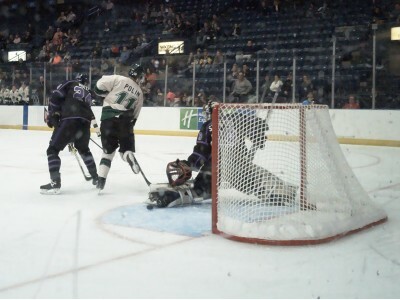 Fortunately, the Phantoms were the team that scored 2 as they met the Cedar Rapids RoughRiders. And fortunately for me, this will be an easy recap. The Phantoms got things rolling early. Just 1:12 into the game, off a good faceoff win by Craig Needham, Steve Holtz took a pass from Trvor Kuntar in the right corner of the 'Riders zone and sent a pass through the crease for Needham to tap behind the 'Riders netminder, Troy Kobryn. The Phantoms would have a bit of a lull in their game, with Cedar Rapids taking control of the offense after the early goal wake-up call. A penalty to Liam Robertson set up a quick powerplay strike for the 'Riders Nathan Smith, putting a shot top shelf over Christian Stoever's glove and just behind the crossbar at 6:53 to tie it. The Phantoms continued to struggle in the first, not registering a shot on goal for about 12:00 after their opening tally. Shots on goal would be 12-4 in favor of the 'Riders at the end of the first. Welcome to Youngstown Chad! - Chad Veltri deflects a puck out of harms way in a thrilling 4-3 OT win against Sioux City. For the second time this season, the Phantoms pulled off a dramatic effort to tie the game in the final moments, setting the stage for an overtime win. 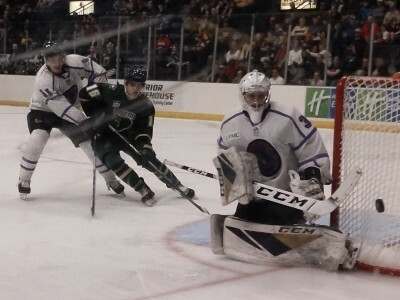 It was also the first game with the Phantoms for newly acquired goaltender Chad Veltri. The Phantoms took the lead early. Jack Malone carried the puck up the left side before turning toward the faceoff circle and finding defenseman Nikolai Jenson, who joined the rush up ice. Malone put the puck on the blade of Jenson, who was able to direct the puck in behind Musketeers goaltender Jake Sibell 2:40 into the contest. The Musketeers answered back at 13:19, when Albin Nilsson snapped a shot from the high slot between a pair of Phantoms defenders that somehow found a crack through Veltri, definitely one he'd like a do-over on. Shots were 10-9 in favor of the Phantoms after the first. The Musketeers jumped out to a two goal advantage in the second. First, with Sibell pulled for an extra skater due to a delayed penalty to Joseph Abate (elbowing), Nisson drove up the right side boards and found a wide open Parker Ford in the left faceoff circle for a one-timer that Veltri had no chance on at 9:50.